Real estate agents are famous for extolling the virtues of homeownership, but do they practice what they preach? Why, yes they do, according to an analysis by Trulia. The homeownership rate of agents is 84.9 percent, 14.8 percentage points higher than the average rate for people in all occupations combined, according to the listing portal. That may not come as a surprise given that the average age of a Realtor is reportedly 57. But even when compared to other people with similar attributes in similar neighborhoods, agents are still significantly more likely to own, Trulia said. 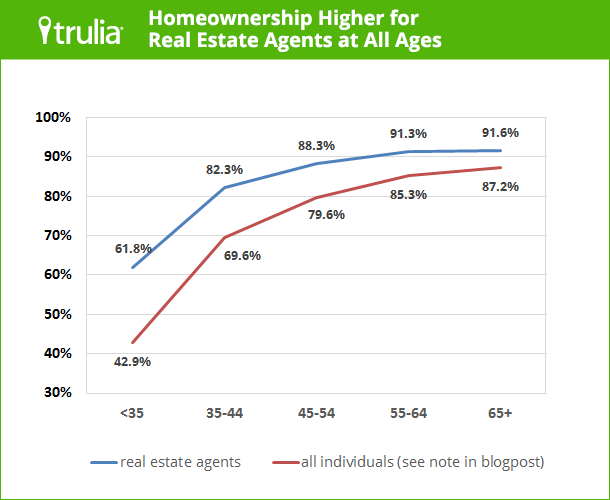 Agents’ homeownership rate is still 4.5 percentage points higher than the average rate when controlling for demographic characteristics, income and location, Trulia said. Realtors’ fondness for homeownership is shared by others in the industry as well. Appraisers, architects, construction managers and other real estate professionals also are more likely to own than their peers, according to Trulia.